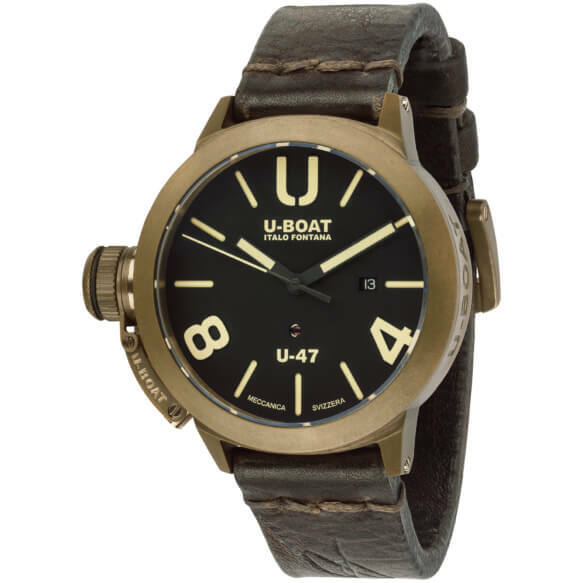 automatic mechanical, personalized to U-BOAT specifications for stem to be positioned at 9 o’clock. Laser cut rotor as by U-BOAT specifications. Frequency: 28,800 vibrations per hour, 4 Hz. Power reserve: 38 hours. 25 jewels. in naturally aged bronze, distinguishing crown on left side, with a patented protective device. Diameter 47 mm. screwed in, fumé glass showing the skeleton balance wheel. three superimposed layers, matt black with visible ruby. Arabic numerals. Luminous beige hands, numbers and markers. high quality sapphire, anti reflective treatment. hand made and hand finished calf leather, tongue buckle in bronze. Width : 23/22 mm.